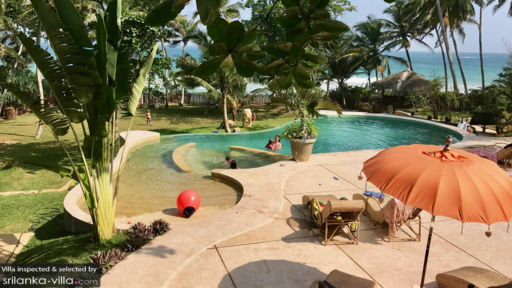 Meda Gedara in Sri Lanka is a stunning beachfront villa that is ideally suited for guests who are traveling with a group of 10 or more people. With seven bedrooms, the villa is spacious and even the sprawling lawns outdoors will prove to be a fun way for the kids to spend their time. Water slides and a private pool along with beach access are all available at the villa! The aesthetics of the villa are calming with a neutral color scheme and large, open windows for the fresh breeze to flow indoors and keep the rooms airy. Meda Gedara offers the guests seven bedrooms and a projector room that can also hold a bed, if needed. Six bedrooms are located on the first floor, and three of these bedrooms are furnished with four-poster, king-sized beds and the fourth bedroom has twin beds. Another children’s room is found on the first floor with six bunk beds. A nursery with twin single beds and is attached to the master suite and shares a bathroom. A garden suite is located on the grounds, separate from the main building, and is furnished with a sleigh, built-in bed and air-conditioning. Five of the other bedrooms, besides the nursery are also air-conditioned and have en-suites. A gorgeous freeform swimming pool invites you into its cool and crisp waters so you can splash around with the kids or your friends and family. The glorious tropical weather of Sri Lanka is the perfect catalyst for a memorable holiday. Head down to the beach for a swim or a stroll, sunbathe and get that tan working, but don’t forget the UV protector! The pool deck is home to sun chairs and parasols and the pool itself is accompanied by a Jacuzzi. For the kids, there are water slides hidden by the lush vegetation that grows on the manicured lawns. 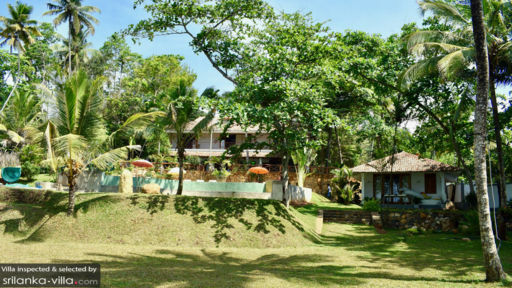 A sala has been dedicated to yoga and meditation, accommodating around 18 people and a teacher at one time. The open-plan living area at Meda Gedara is refined and luxurious with the simplest of colors highlighting the pleasing, traditional aesthetics of the private holiday home. 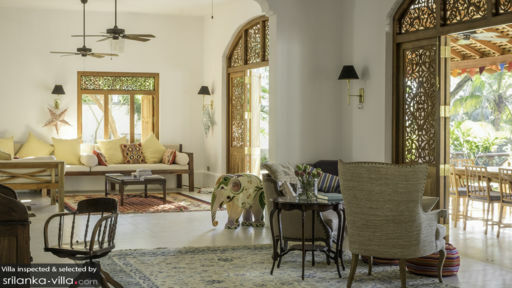 Intricate wooden archways, marble flooring, comfortable sofas, and a variety of antique armchairs don the living area making it homely and cozy for all the guests to gather around for quality time. Traditional artefacts are found decorating the cabinets that enhance the understated beauty of the interiors. The dining area is located on the verandah overlooking the beach and the swimming pool. A 14-seater dining table is lavishly set up for a beautiful dinner amidst natural elements that are sure to perk up your mood and lift your spirits. The kitchen is open so everyone can enjoy together and a breakfast table is placed in front for a fun time. A media or kids’ snug room with sofas and toys is great to keep the kids occupied. The staff is excellent and experiences in providing quality services to guests of the villa. There is a resident manager to oversee the functioning of the villa including housekeeping, maintenance, and the security detail. Since the beach is right at your doorstep, head down to explore its sandy shores and play in the water. Check out some of the restaurants that are in the vicinity such as Eagle Nest, Visma Plus, Island House, and many more. You can find much to do in the area as you walk around and discover the hidden gems in Sri Lanka!